Welcome back. Amrith Ramkumar here with you setting up the week ahead as investors look to the start of first-quarter earnings season. JPMorgan and Wells Fargo kick things off on Friday, with S&P 500 companies expected to report their first drop in quarterly profits from a year earlier since 2016. We'll also get fresh inflation data this week and a look at minutes from the Federal Reserve's last meeting. Futures are slipping, after stocks moved closer to fresh highs with another advance Friday. The S&P 500 sits 1.3% below its September record. Plus, our Ira Iosebashvili explains why some investors are chasing greater returns in emerging-market assets. Global stocks traded slightly lower as investors weighed last week’s rally, following progress in U.S.-China trade talks and strong U.S. employment figures. A cautious shift from global central banks is sending investors hunting for big paydays in emerging-market currencies, despite concerns that global growth may continue to slow. Many are employing a strategy known as the carry trade, in which an investor borrows in a low-yielding currency to roll the funds into a higher-yielding emerging-market asset, such as local bonds, and pockets the difference. Emerging markets are a popular target for carry traders because they often offer yields that are much higher than those found in developing countries. For example, Turkey’s three-month deposit rate, which traders use to calculate returns on carry trades, stood at 28% on Friday, while Russia’s was at 7.9%. The analogous rate in the U.S. is at around 2.6%. An investor borrowing in dollars and buying Turkish assets hopes to collect a yield of more than 25% over three months, without accounting for moves in the underlying currencies and transaction costs. The trade’s popularity is another example of how recent signals from the world’s biggest central banks have encouraged investors to embrace riskier strategies. Expectations that interest rates are unlikely to rise have made high-yielding emerging-market currencies more appealing. Meanwhile, a calm stretch in markets has allowed investors to collect yield without worrying about losing gains to unfavorable currency fluctuations. Carry trades can backfire if markets turn rough, though, sometimes erasing weeks of gains in a single trading session. The Turkish lira dropped during a bout of investor jitters last month, although it has recovered some of its losses. Argentina’s high yields have been undercut by its steadily falling peso. Many carry traders are watching for signs that growth is continuing to ebb despite central bankers’ efforts to contain the slowdown, a development that would likely push many to lower positions in riskier assets. So far, the signals have been mixed: manufacturing data for China and the U.S. improved in March and U.S. hiring bounced back after a weak showing in February. A separate risk is a rebound in U.S. economic performance that bolsters the case for the Fed to tighten monetary policy again. Higher interest rates tend to dent the allure of emerging-market assets, while also making it harder for countries with dollar-denominated debt to service their loans. “For emerging markets, the sweet spot is somewhere in the middle,” said Ed Al-Hussainy, senior interest rate and currency analyst at Columbia Threadneedle. After tumbling 1.9% on March 22, the S&P 500 rose 3.3% in the two weeks ended Friday, its best two-week stretch since mid-January. The benchmark is on a seven-day winning streak, its longest such run since October 2017, when it rose for eight consecutive days. U.S. crude oil climbed for the fifth consecutive week last week, its longest stretch of weekly advances since November 2017. Oil hit a five-month high on Friday and is now up 39% for the year. Hedge funds and other speculators lifted net bets for the sixth consecutive week during the week ended April 2, according to the latest Commodity Futures Trading Commission data. 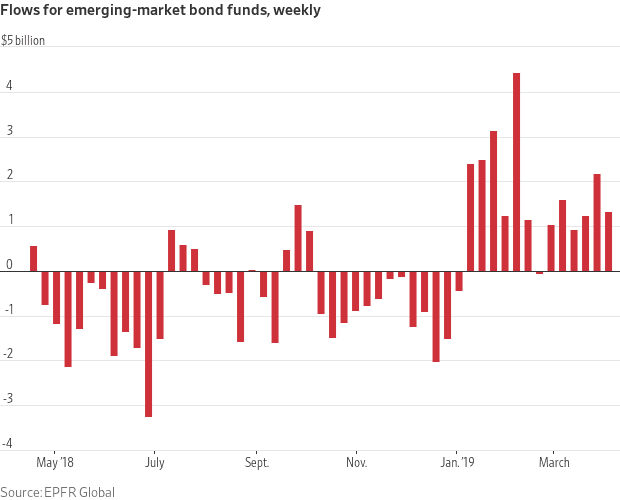 About $7.7 billion flowed out of global equity funds during the week ended Wednesday, bringing the year-to-date outflow total to $87 billion, according to a Bank of America Merrill Lynch analysis of data from EPFR Global. About $11.4 billion flowed into bond funds, bringing the 2019 inflow total to $98 billion. U.S. factory orders for February are expected to fall 0.5% from the prior month. The figures are scheduled for 10 a.m. ET. An expected earnings pullback is setting up a big test for the bull market. The stock market has been on one of its strongest runs in two decades, but a looming pullback in corporate profits poses a threat to its rise. Gold badges, boozy breakfasts and denim suits: NYSE and Nasdaq’s frenetic fight for IPOs. The battle for listings between NYSE and Nasdaq is set to be epic this year, with values potentially beating the dot-com-era record. Global investors are lining up for a shot of kerosene-smelling Chinese liquor. Kweichow Moutai has captured the imagination of global investors as a proxy for affluent consumers in the world’s second-largest economy. U.S. stock funds rose 13% in the first quarter, but bonds drew cash. Positive results so far this year, as exemplified by the first quarter, have defied predictions that the market will tire. How’s your ETF portfolio doing? Good luck finding out. Ready-made “model portfolios” are growing—but there is no standardized tracking of performance, making comparisons difficult. Pinterest aims to lowball its IPO price range. Pinterest plans to set a price range for its initial public offering that is below where the online image-search company last raised money privately when it begins a roadshow to pitch the shares to investors Monday. Trump administration officials are backing Herman Cain despite scrutiny. White House officials on Sunday backed Herman Cain for a seat on the Federal Reserve’s board of governors even after the former restaurant executive and onetime GOP presidential candidate warned that he expects renewed scrutiny of sexual-harassment allegations against him. Falling fees are boosting the appeal of sustainable ETFs. 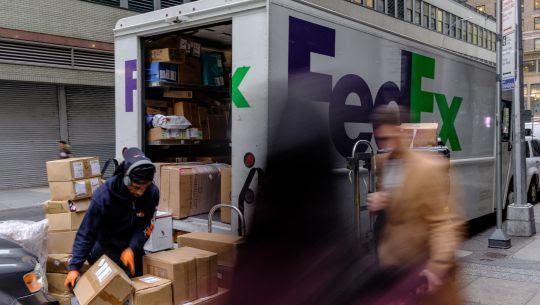 The fee-cutting fervor sweeping the U.S. asset-management industry is drawing more investors into exchange-traded funds built on environmental, social and governance criteria. An investigator, a financial-adviser “heir” and an elderly client: How lines get blurred in insurance regulation. A financial adviser and his firm faced no regulatory action after a state investigator concluded the adviser acted unethically and violated Maryland insurance laws when he received a windfall from an elderly client’s estate. Boeing: The aerospace company will cut production of its 737 MAX by a fifth and appointed a special board committee to examine its development of new planes late Friday following two crashes of its best-selling jetliner. CVS Health: A federal judge said he wants to hear in court from witnesses who object to the Justice Department’s decision to allow the company’s acquisition of Aetna. The deal closed in November. Hess: Shares of the energy company rose 3.7% Friday to their highest level in five months. They have climbed in four consecutive weeks. Urban Outfitters: Shares of the retailer have climbed in 10 consecutive sessions, the longest such streak since November 2017. Tesla: The electric auto maker’s board of directors reviewed allegations that CEO Elon Musk pushed a former senior leader at the company in a heated confrontation after the employee had resigned, Bloomberg reported. Tesla’s board concluded there wasn’t a “physical altercation” and didn’t address the allegations of physical contact or verbal abuse, the report said.